Quilting – the act of cutting perfectly good fabric into little pieces and then sewing them back together again. Quilters are people who enjoy cutting new fabric apart to sew it together again. It sounds counter-intuitive and a bit crazy, but it is actually fun to do. I’m lucky to have a mom who is a Quilting Queen, so I never have to learn from a book or even take a class. I just go sit in her sewing room when I want to learn something new or get help with a project I’m thinking about. This time I wanted to tackle making a table runner for the living room table. I have a few ones I really like already that I alternate between, but not one that I have made myself. And I wanted this one to scream iHanna style out loud. I picked mostly polka dot fabrics (and some of the new ones I recently bought plus just a hint of stolen fabric from mom’s stash) in my current color crush combination: magenta pink and bright orange. Isn’t that the most stunning combination of all times? I’m in love with it. I can never resist happy colors and great, simplistic patterns. I think that’s one of the reasons I like to sew. I can collect fabric (in small quantities of course because of limited space) and claim these happy colors as mine, mine mine! So I rarely use a sewing pattern, and I didn’t this time either. I didn’t have a plan for how to do this table cloth more than knowing I wanted to work with strips of fabric. So I cut down the different fabrics into strips of different withes, and sewed them together again. They became square blocks that I made a puzzle with, to fit it all together. My quilting is wonky but looks okay from a bit of a distance, and I’m happy with that. I picked a vintage fabric featuring tiny fruits for the back, and a green border to make it pop a bit more. I am super happy with the result of sewing my first quilted table runner together. Since about a year I’m the Editor in Chief for another Swedish Guild magazine. It is about quilting and comes out four times a year, so I am privileged to work with quilting patterns and images of quilts all through the year, and they inspire me. Every time I start working on a new layout, I want to sew something too. So consider yourself warned, and expect to see more projects coming up. 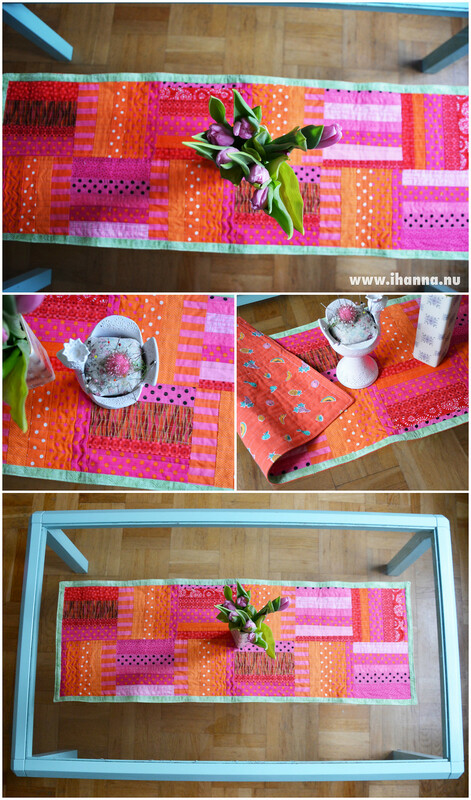 This quilted table runner / table cloth turned out 103 x 63 cm (40,5 x 24,8 inches). I think it looks great on my turquoise glass table. Not as easy to clean as the blue polka dotted table, but just as happy and dotty. And in the best of color combinations. What do you think? 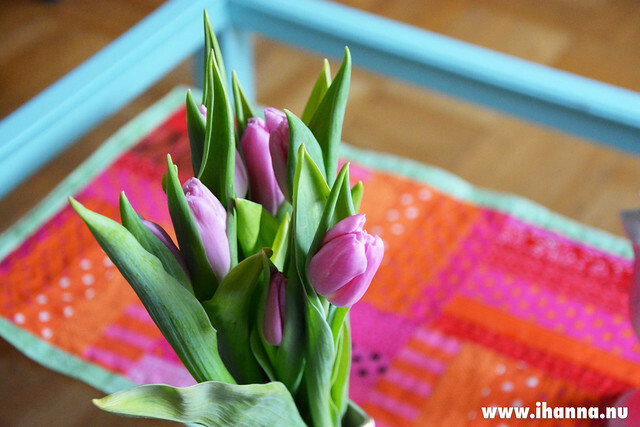 Are you a quilter or a wannabe quilter like me, and what’s your favorite thing to sew? This entry was posted in Fabric & Sewing, Home Comforts and tagged on my desk, polka dots, quilt, sewing. Bookmark the permalink. 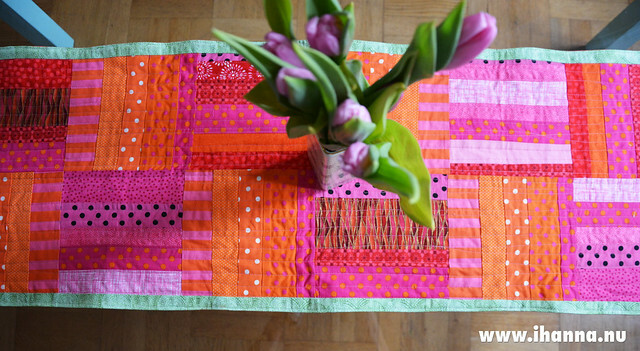 I love how your table runner turned out; great piecing and the color combination is great! Thanks for showing it off. As far as what I like to sew, I guess it’s stuffed toys for me. A couple of years ago, I was surrounded by neighbors having babies, so each newborn got a handmade stuffed toy from me. Parents and babies alike were pleased by my gifts, or so I was told, anyway. And as for quilting, I’ve made a couple of simple patchwork-style quilts, and am currently working on a yo-yo quilt. 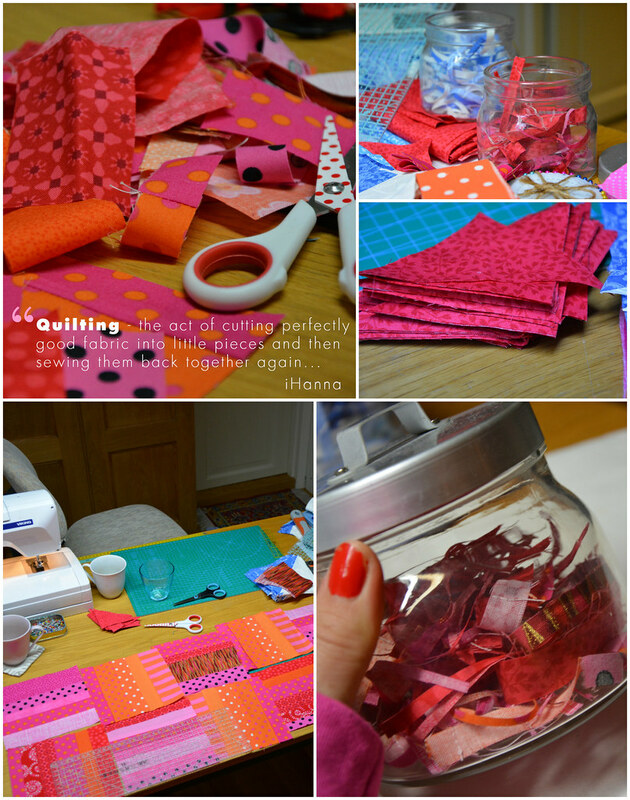 Great way to use up fabric scraps! Wow, what an awesome table runner! Great blend of fabrics & it’s so well suited for that table. I’ve sewn tons of quilts over the years, and incorporate patchwork into other things, too, such as purses and pillow covers. Although it’s been awhile since I’ve done anything, and I have a ton of scraps that’ve built up from other sewing projects. One of these days I’ll find the time….